How Do Termites Get Into My Home? Home » How Do Termites Get Into My Home? Termites are pests that can wreak havoc on your home. Understanding how termites invade your space and why they want to get inside is helpful in understanding how infestations occur. Subterranean termite colonies are located underground. Termites originating in these dwellings typically enter homes at ground level areas or below them. They can also build mud tubes and enter spots several feet above the ground level. Termites of this type often enter through wood-to-ground contact in areas like deck posts, porch steps, porch supports, door frames, or in cracks in the foundation. Subterranean termites are also capable of using holes in concrete blocks to get through foundation walls. Your pest prevention specialist will look at specific areas and uncover signs of activity. If needed, we may recommend direct wood treatment or liquid soil treatments, always sourcing the most environmentally-friendly solution possible. 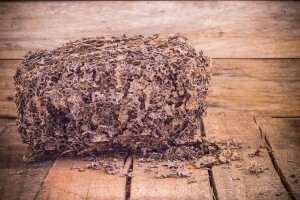 Drywood termite infestations can happen when a swarm of termites finds a small crevice in the wood of the home and creates a nest to seal themselves in. Once the nest is made, they will lay eggs and build the colony. Over time, the colony can grow big enough to cause significant wood damage. If you have drywood termites, they can enter the home on any floor, not just near the foundation or in the soil, as with subterranean termites. To keep them away, keep the exterior wood of the home in good condition and have it serviced by a pest control specialist on a regular basis. Can You Ever Get Rid of Termites Completely? Termite infestation can be difficult to treat and often requires complex treatments, implemented by a professional. Treatment usually requires special tools and techniques as well as carefully-formulated soil treatments, so be sure to talk to our team at The Bug Man to see what is recommended. There is usually a customized treatment and prevention plan based on your home’s unique situation. To prevent infestations from this type of termite, remove access and food sources as best as you can, reduce excess moisture, and hire a professional to monitor activity. Fortunately, termite damage can be repaired in most cases. Damaged wood can often be removed and replaced with new, fresh wood. Check with a contractor or other building professional to learn more about termite-damage repair and restoration. Have questions about preventing or treating a termite infestation? Contact our helpful and experienced team at The Bug Man, today!